RSFirewall Wordpress - I cannot access my administration section! Home / Support / Documentation / RSFirewall! (WordPress) / Frequently asked questions / I cannot access my administration section! This will automatically disable the RSFirewall! plugin, thus the firewall restrictions won't be applied. [RSFirewall! folder name] - is inherited from the installation archive name, though you'll find RSFirewall! as part of its naming. You will then be able to access the admin section as you would normally do and revert your RSFirewall! settings. Remember to eventually remove this .disabled file to have RSFirewall! running once again. 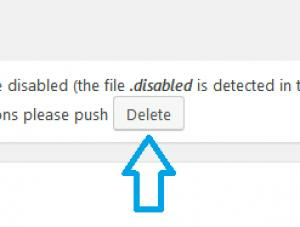 Either manually via your FTP account, or from your admin section by clicking the Delete button (screenshot on the right).